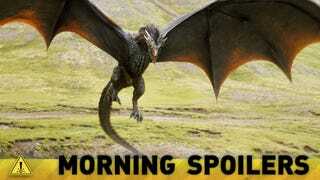 What Book Changes Are Revealed in These Game of Thrones Photos? More turns on the Star Wars rumor-mobile, including information on villains and casting. There's a denial of a grim Batman v. Superman character rumor. And another of Ryan Murphy's favorite actors may be showing up on American Horror Story. Spoilers now! A little bit more speculation from the rumors about Emperor Palpatine's return and the Inquisitors being the villains of Episode VII: Latino Review's now saying that they're pretty sure that no one in the film is actually called "Inquisitor," but are just a bunch of Sith. The "Inquisitor" name, it's speculated, is a retcon to deal with the prequels' whole "there are always only two Sith" thing. Speaking of the Sith, Latino Review also hears that the filming location of Skelling Michael Island, which played host to Mark Hamill and Daisy Ridley and that the crew will return to film at later, is the Sith homeworld. And the ruins there are the control center for the planet, which is also a weapon. Latino Review does warn that the Sith homeworld was in an old version of the script, too, so it might not have survived the rewrite process. The next rumor, which they claim is fact, is a refutation of the speculation that Domhnall Gleeson is playing Luke's son. If the rumors of Luke having been missing since just after Return of the Jedi are true, than he's been a prisoner the entire time and has no children. Remi Gooding is a child actor who recently appeared on stage in Matilda in London's West End. Kiran Shah is a dwarf actor who has appeared in The Chronicles of Narnia: The Lion, the Witch and the Wardrobe, The Hobbit and Star Wars: Return of the Jedi amongst many other roles. Robert Goodman has previously appeared in Doctor Who in a number of uncredited roles throughout the years, including The Trial of a Time Lord, Arc of Infinity, Full Circle and Nightmare of Eden. Star Noah Wyle teased a bit about what Tom was looking at in the last shot of the finale, saying, "All I'll say is it's not a new alien race that we're looking at. It is something we haven't met before, but it's familiar." Of course, I'm not at liberty to deliver fully disclosed spoilers, but I will tell you that what Tom does see will prove to be the sort of lynchpin in what drives [the 2nd Mass] and provides a strategic angle for the 2nd Mass to pursue in the fifth season. I wouldn't say they discover a doomsday device, but what they discover is a strategic weapon of sorts that will prove to have a great impact on what happens in the fifth season. It is a more emotional, internal motivation that propels Tom Mason in season 5. It's not just about tactics or looking at war room maps, although that remains a big part of the show. It's about how even the best generals will tell stories about how they had to rely on their gut, and [season 5] is a season in which the gut aspect of Tom Mason's approach to defeating the enemy takes on a much more prominent role via the encounter he has at the end of season 4. So through that encounter we will emphasize the emotional aspects of his decision-making, his strategy, and the ultimate outcome.